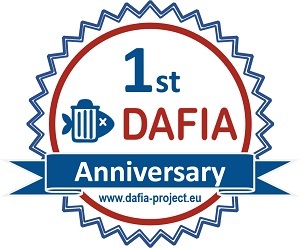 The DAFIA project, a Horizon 2020 project that aims to convert municipal solid waste (MSW) and residual material from fish processing into useful products, is approaching its one-year anniversary. To mark the occasion, the third meeting of the DAFIA consortium was held in Copenhagen on the 29th of November. 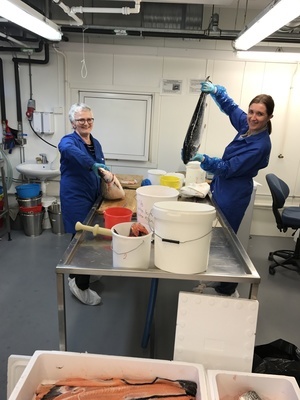 The first part of the project has focussed on characterising different types of MSW and fish residues, and processing them to enable their use in subsequent chemical and biotechnical processes. The project has celebrated several achievements in it’s first year: fish residues have successfully been converted into flame retardants for use in polymer blending, and the organic fraction of MSW has successfully been processed into a nutrient medium for microbial cell factories making monomer chemical building blocks. In the second year of DAFIA, the microbial conversion of processed waste into diacid and diamine building blocks will be optimised, and scale-up and purification will commence. Additionally, polymers will be synthesized from the isolated monomers. Food packaging and coatings from gelatine (derived from fish-processing residues) will also be developed. In addition, work on the techno-economic and life-cycle assessments will start. In total, the project will run for 4 years, with the final years focussing on scale-up and standardisation of all developed processes for easy commercialisation. For more information, please subscribe to the DAFIA newsletter via the homepage http://www.dafia-project.eu/ or by e-mailing info@dafia-project.eu. This project has received funding from the European Union's Horizon 2020 research and innovation programme under grant agreement Nº 720770.